Lurid horror, women-in-prison movies, blaxploitation, etc. We as horror fans sometimes fall into the trap (usually it’s a bear trap, thanks to the extreme horror movement of the early millennium, Saw, etc) that it’s necessary to reinvent the wheel. 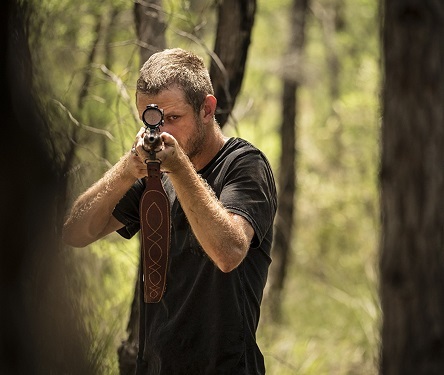 Something like Killing Ground, takes the standard backwoods maniacs prey on city slickers motif, and tweaks it just enough to provide…deliverance. Hell, there’s a sly nod to the above…in the form of a dog named Banjo. And speaking of music, we’ve made the blues song analogy prior and it’s worth mentioning here. Within the strictures of three chords, so much is possible to the point where Sweet Home Chicago is sufficiently different from Stormy Monday. And those 12-bar blues classics are different from say, Tracy Chapman’s Give Me One Reason. So yes, Killing Ground is a lot like other hicksploitation films. It’s got an effete urbanite, his wife, some kids, a locale far removed from help…crappy cell reception…but it’s undeniably well-made. It’s a great three-chord song. There are two ex-cons we meet in a crappy bar on New Year’s, and they make their presence felt by sexually harassing the patrons and generally by being unhinged degenerates. They are boar hunters, and are comfortable in the Outback…where they lay eventually go to lay waste to two groups of city folk. The story is non-linear, something that serves this film well. The performances are dynamite, especially solipsistic teen Em portrayed by Tiarnie Coupland. And unlike other survivalist horrors, we’re ever-so-gradually drawn into Killing Ground’s setting (and a beautiful one it is…a meandering stream, and gorgeous mountain vistas). In fact, a good half the film goes by before tension is dialed up, and boy is it EVER dialed up. Debut Director Damien Power (Sydney by way of Tasmania) gives a great accounting of himself. Killing Ground is highly detail-oriented, from the footsteps in the woods to the rifle aimed at the viewer. 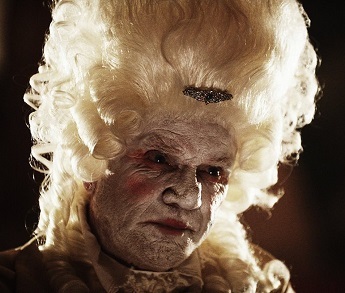 If Malcolm McDowell (no stranger to terrible movies) heeded the advice of the film agent he played on Entourage…well, he’d have told himself to pass on Rob Zombie’s 31, a boring, ugly, stupid, awful misfire that makes RZ’s Halloween reboot look like the summit of achievement. 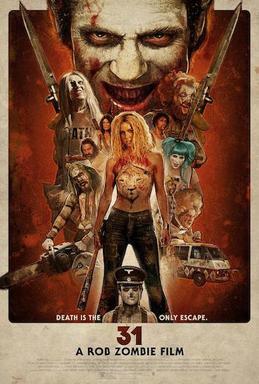 It’s pretty pathetic for someone as rich and successful as Rob Zombie to crowd-fund their art, essentially double dipping as it’s getting people to pay for a finished product, not once, but twice. Thankfully, this reviewer happened upon 31 through a library digital streaming service, Hoopla. But no fanfare for this tale, about a bunch of carnival freaks in a touring van who are forced to fight to the death in a game of the same name — 31. It’s painstakingly drab, cheap-looking, and not even juiced by the presence of a wrinkly, baked-in-the-hot-sun Meg Foster or a neo-Nazi midget (if you can’t shock with a neo-Nazi midget, then it’s time to find another line of work). Harlequins, carny folk, big tops…It’d be nice to see RZ put aside his clown obsession. Then again, it’s even bled into his other business as well: he and his band performed the Grand Funk Railroad classic rock radio chestnut “We’re an American Band,” on Kimmel, bedecked in clown make-up, which provided more frights than this.